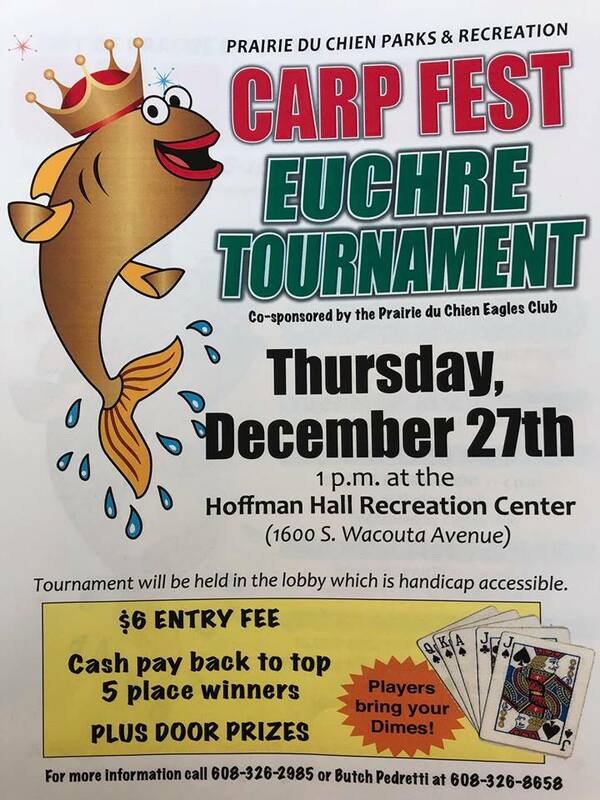 Despite the snowy condition, 24 people participated in this year CarpFest Euchre Tournament at City Hall sponsored by the PDC Eagles Club. The Top winners (left- right) were: 1st-Lucky Lenny Zabel(94),2nd-Pat Check(93), 3rd-Ron Vick(92),4th-Ruth Morris(85),5th-Joan Davis(84), Euchre Guru/ Coordinator Butch Pedretti. Following "The BIG Snow" bowling turned out to be a fun way to spend an afternoon at Leisure Time Sports Bar and Grill. The lanes were busy with families in friendly competition. Fun and laughter were shared by all. 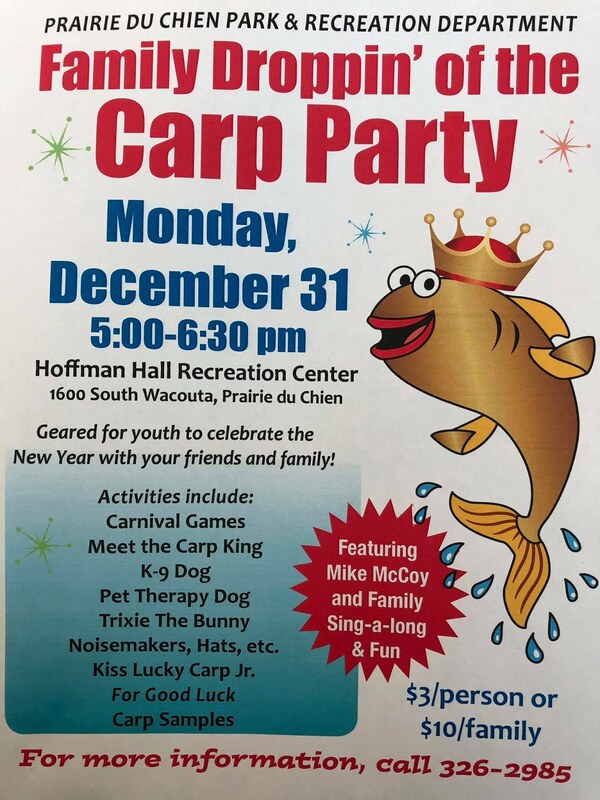 There is only 2 days left of Carpfest with open Gym/Swim from 1-4pm both days at Hoffman hall for $1 and then the Big Lucky Jr. Carp Drop Party on Thursday(6:30-8:30pm) at Hoffman Hall followed by the Grand Finale Lucky Drop at Midnight with pyrotechnics, bonfire, and new this year free snowmobile rides!! 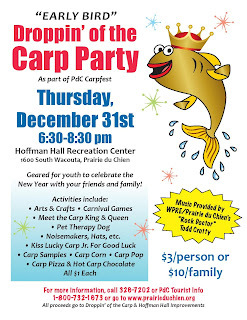 Hard as it may be to believe, 2015 is all but gone – which, here in the Driftless Region, can mean only one thing: Carp Fest and the Droppin’ of the Carp! 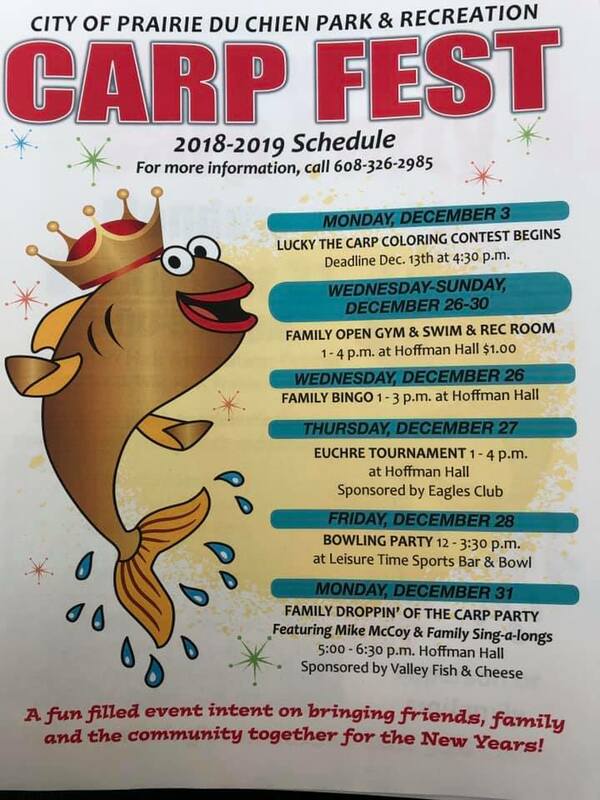 We all know about the big crystal ball that drops in New York’s Times Square but, in Wisconsin’s Prairie du Chien, it’s the Droppin’ of the Carp and Carp Fest that folks wait for to mark the end of their year.